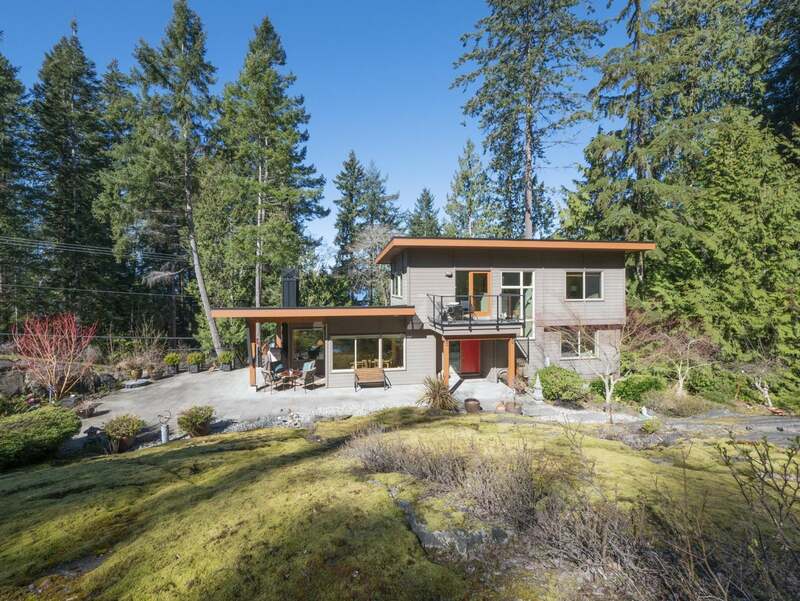 A work of art, 8688 Redrooffs Road was designed by an artist with the help from her architect. 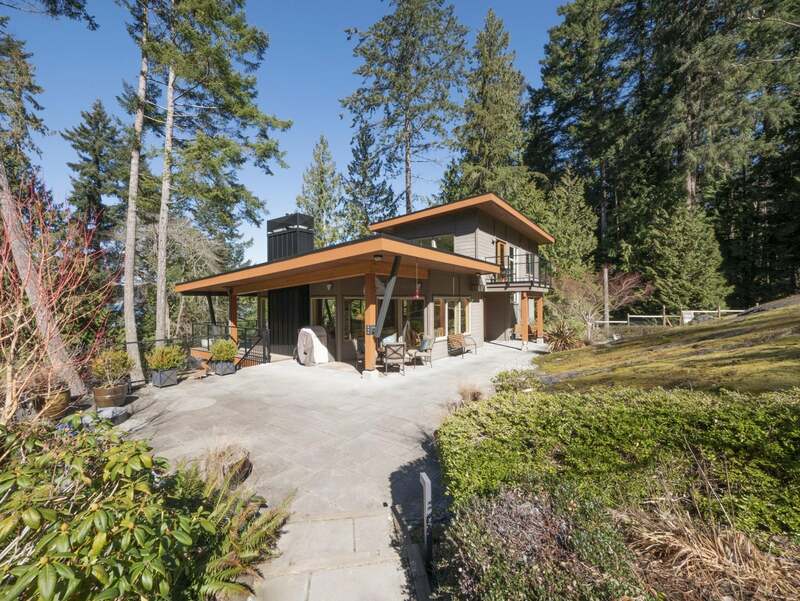 This three-bedroom and three-bathroom home magnificently blends indoor and outdoor living. 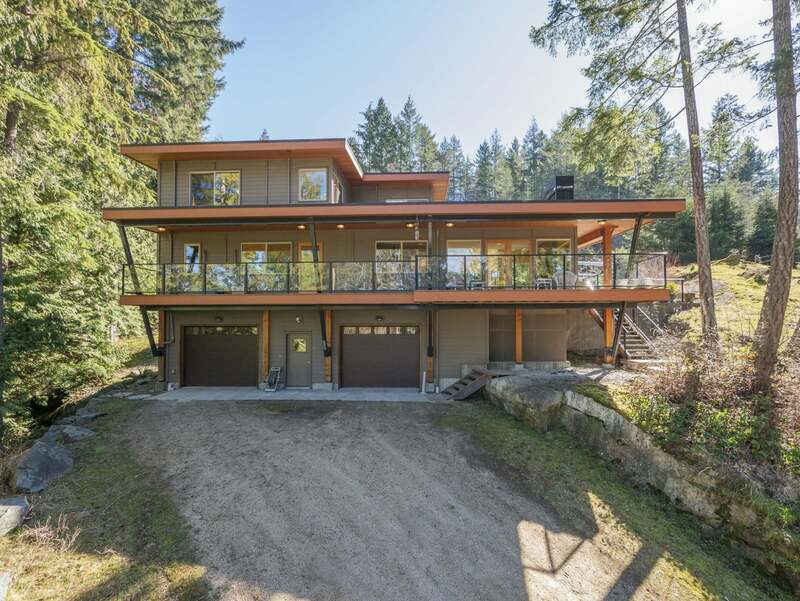 You’ll love all the natural light inside this custom built 1,756 square foot home. 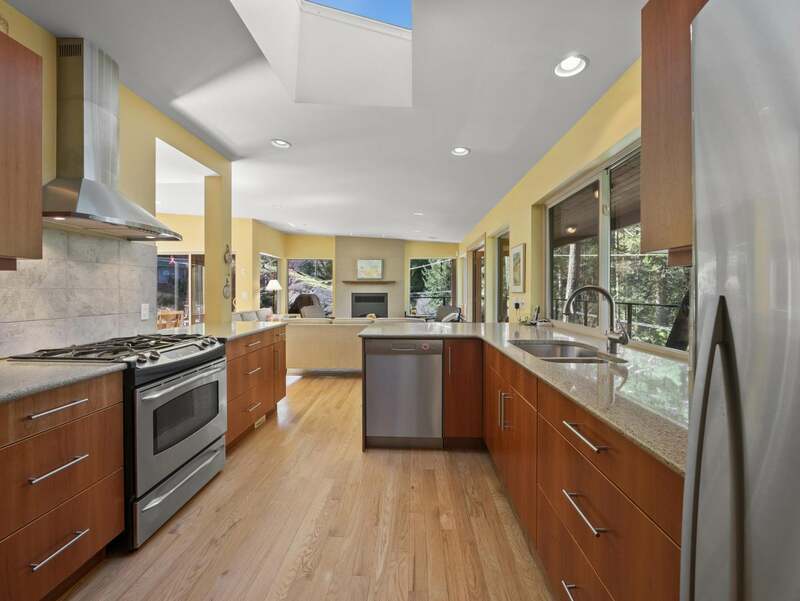 This home boasts a custom kitchen, a studio space, and a master bedroom on the main level. There’s a separate workshop and a 657 square foot garage/workshop on the lower level. Walk 200 steps from your front door and you’re standing at a sandy beach. Also is nearby Coopers Green Park. 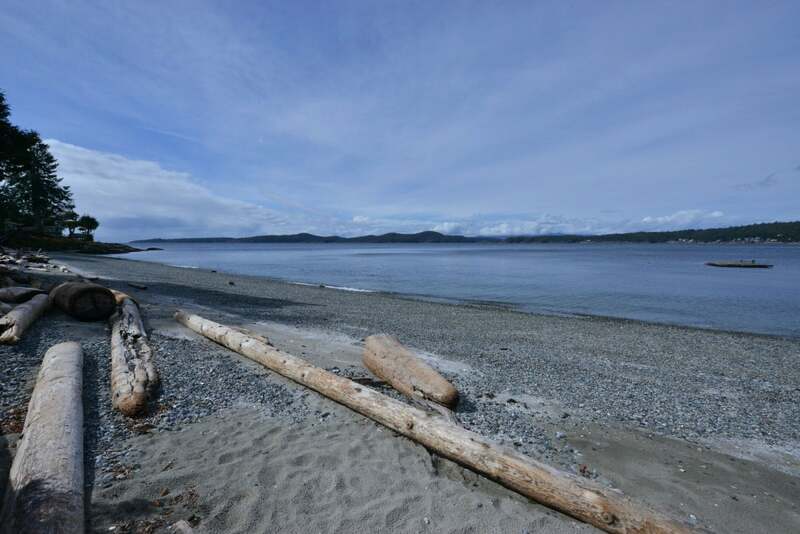 In addition to family picnic areas, beach volleyball courts, and public facilities, this popular waterfront park has one of the few public boat launches of the Sunshine Coast. Let’s head towards the home now and have a walk-through tour. Inside the entryway, we walk past a washroom and the access door to the lower level garage and arrive in the master bedroom. 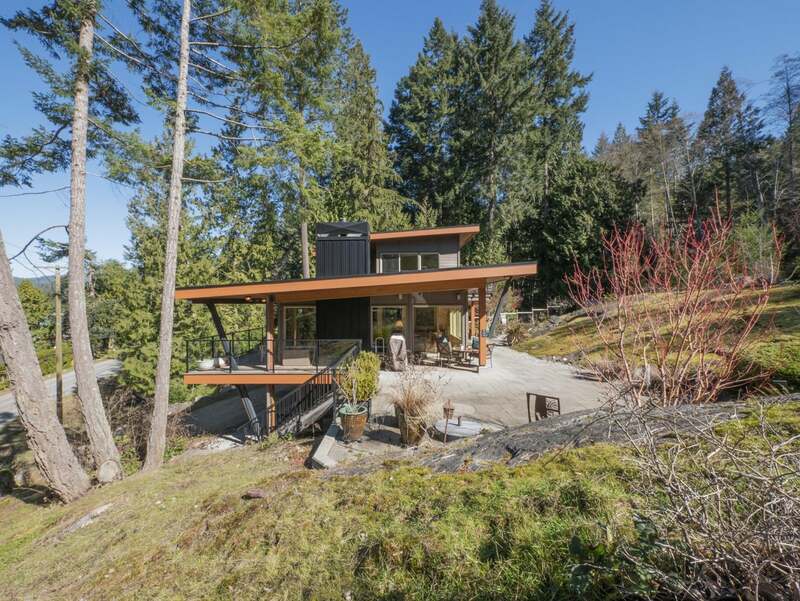 It has carpeted floors, has two big windows, and an ensuite. 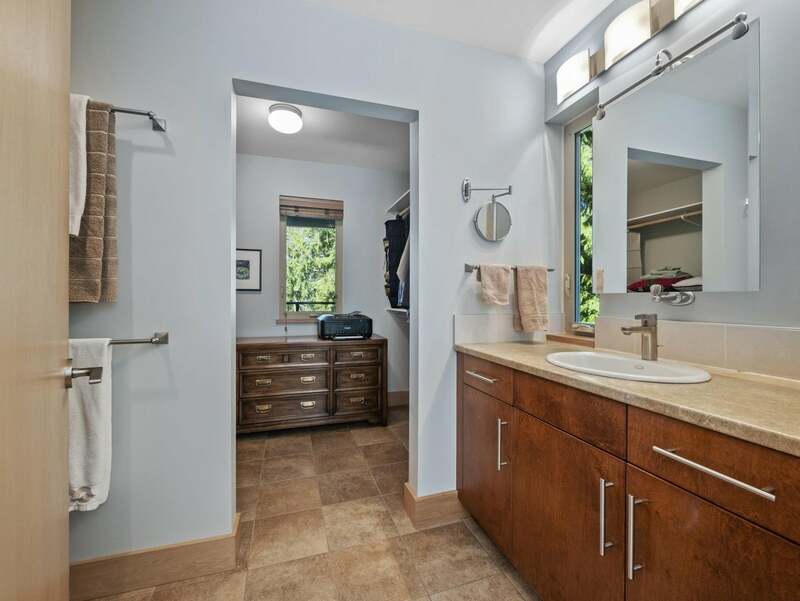 The ensuite’s vanity has windows on each side of the mirror which lets in natural light. Next is a walk-in-closet with natural light thanks to a window. 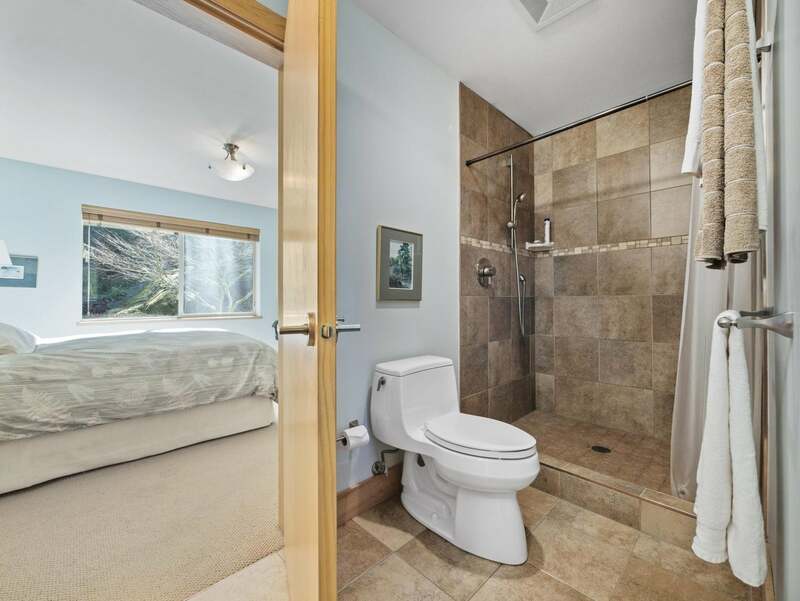 We have a look at the ensuite’s large walk-in tiled shower before heading back through the large master bedroom. Continuing on, we see the entryway closet as we make our way into the main living space. 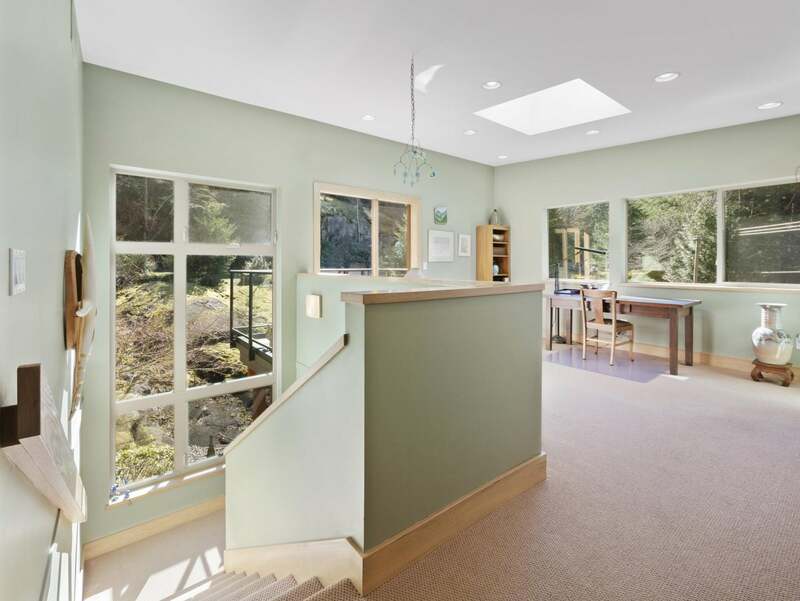 Windows all around fill the space with welcoming light and creating a warm ambiance for visiting with family and friends. 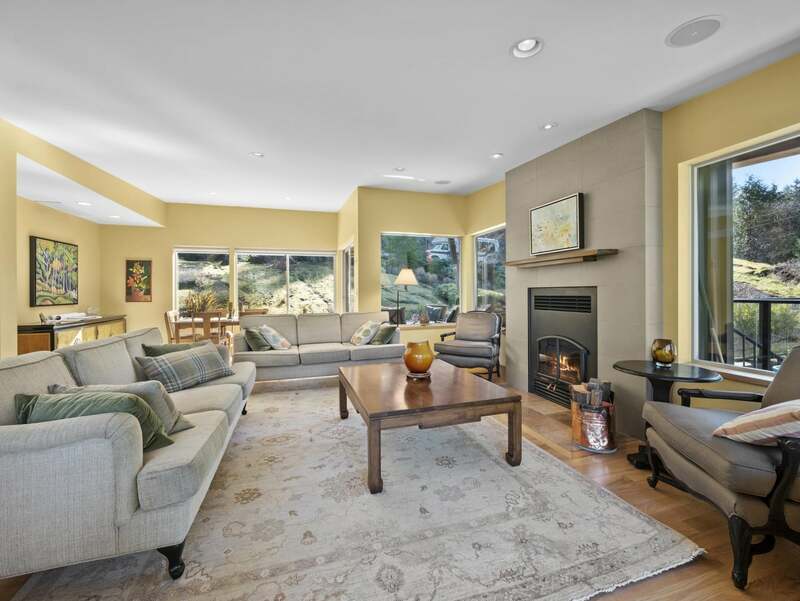 The seating and entertainment space seamlessly extends to this lovely, extra-large outdoor patio. 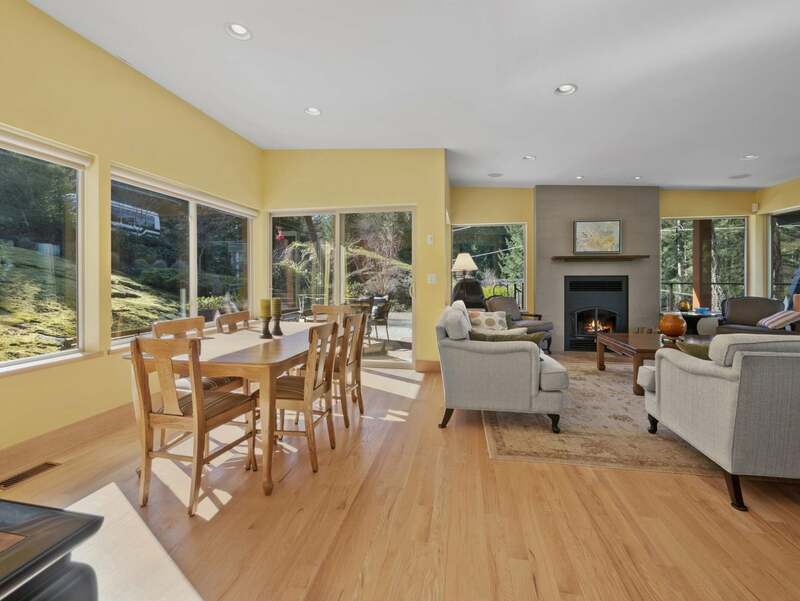 Turning back inside, we take another look at this grand space with the dining area, the kitchen, and the living room with its wood-burning fireplace. 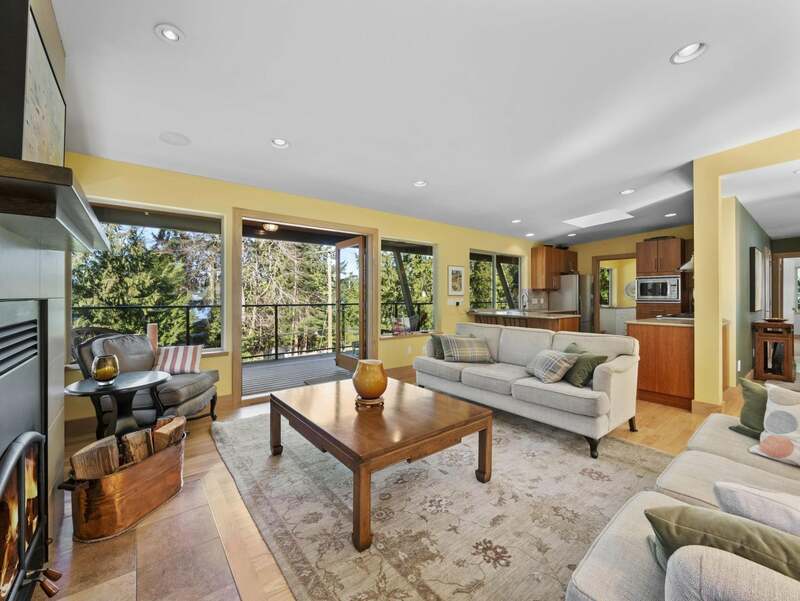 Walking through the living room, we’re drawn to double open doors and step onto the adjoining front deck with its peak-a-boo ocean view. 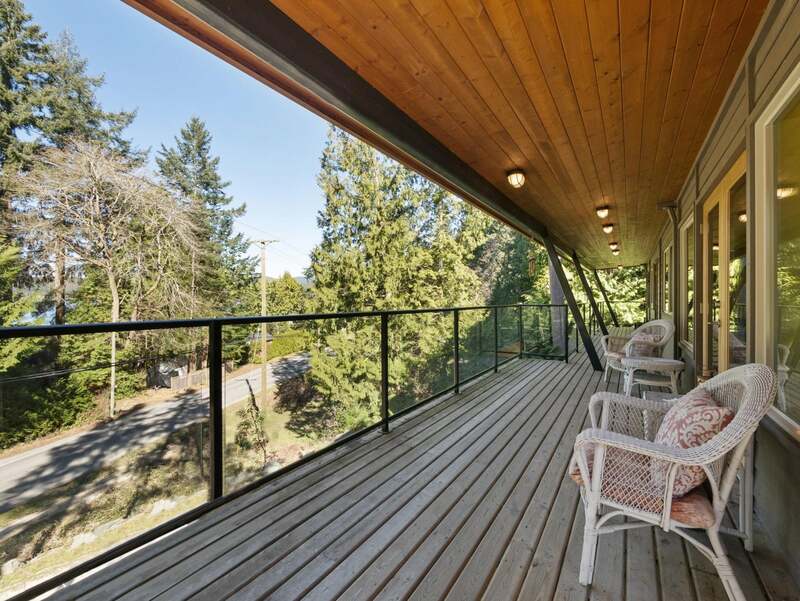 This is a large deck that extends the length of the home and wraps around to the back patio. 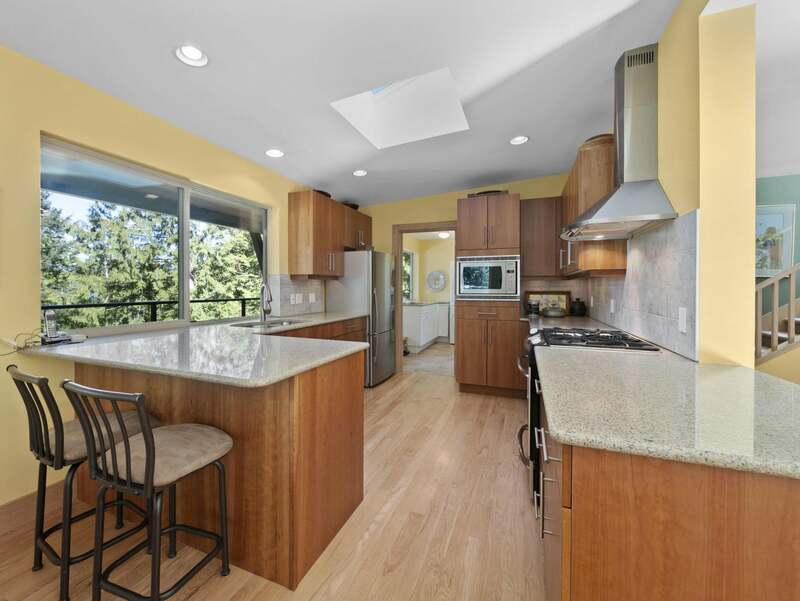 Back inside and exploring the kitchen, we notice granite counter tops, gorgeous cabinetry, and gleaming stainless-steel appliances including a gas range. 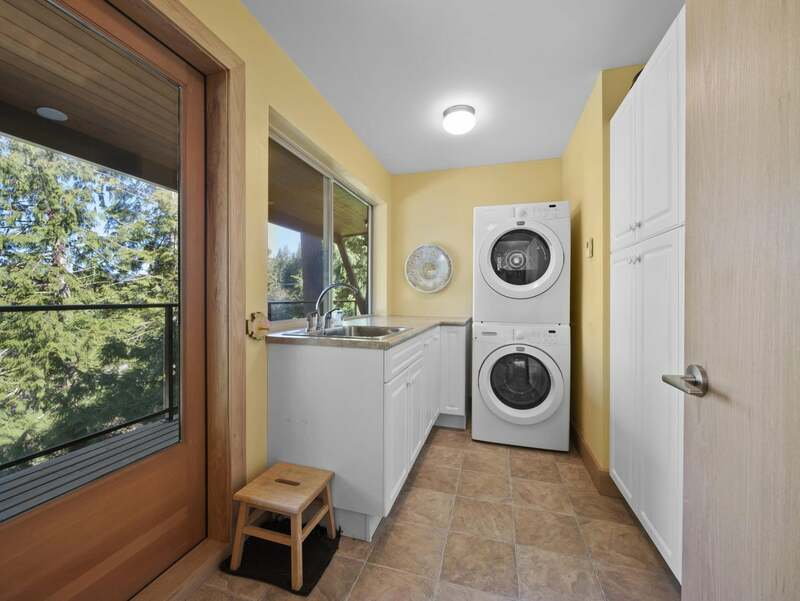 Next to the kitchen is the laundry room with cupboard storage on the right and a sink with counter and storage space on the left. There’s access to the front deck here, too. Relocating ourselves to the foyer, we head upstairs to continue our tour. 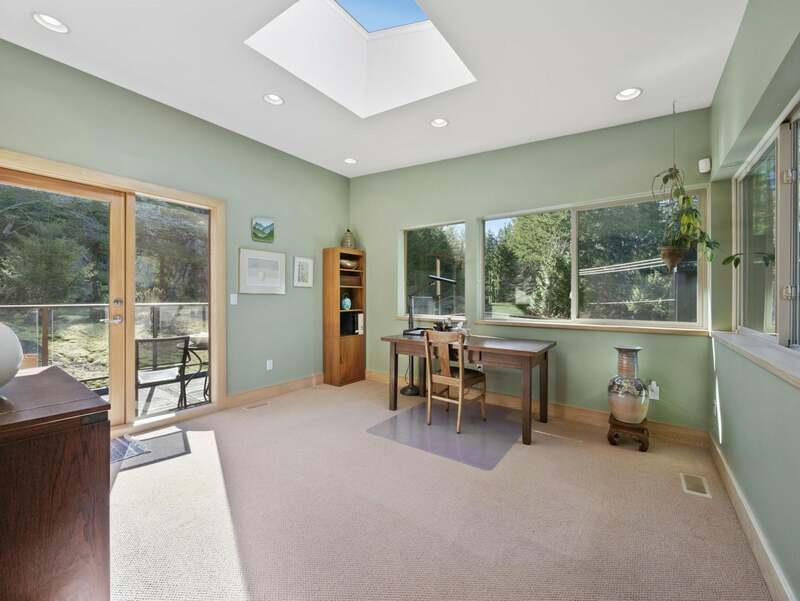 From the top of the stairs, we see a bonus studio space with large windows, a skylight, and its own deck. This is a perfect spot to sit with a cup of tea while reading a book. 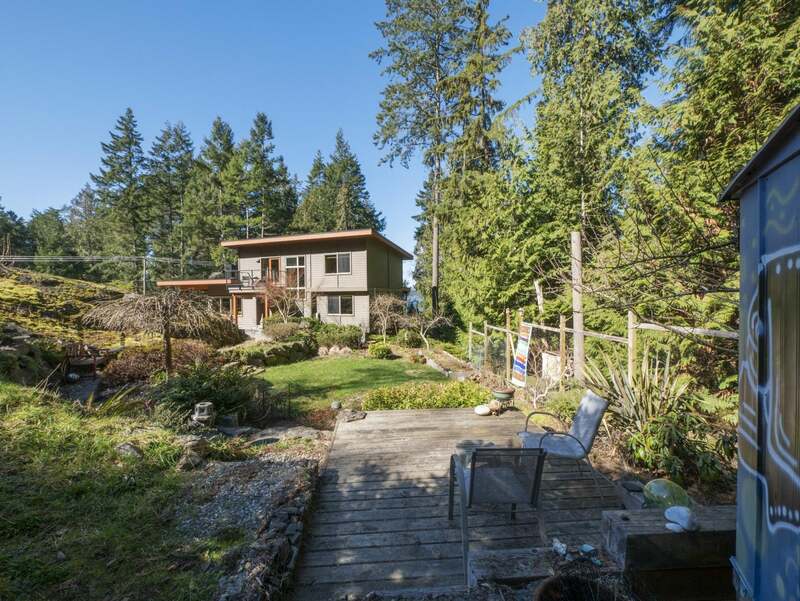 Below us is a gorgeous private backyard that radiates vivid natural colour in the sun’s rays. Back inside, use this calming space as an art of yoga studio and enjoy its peek-a-boo ocean views. We turn to this level’s full bathroom. 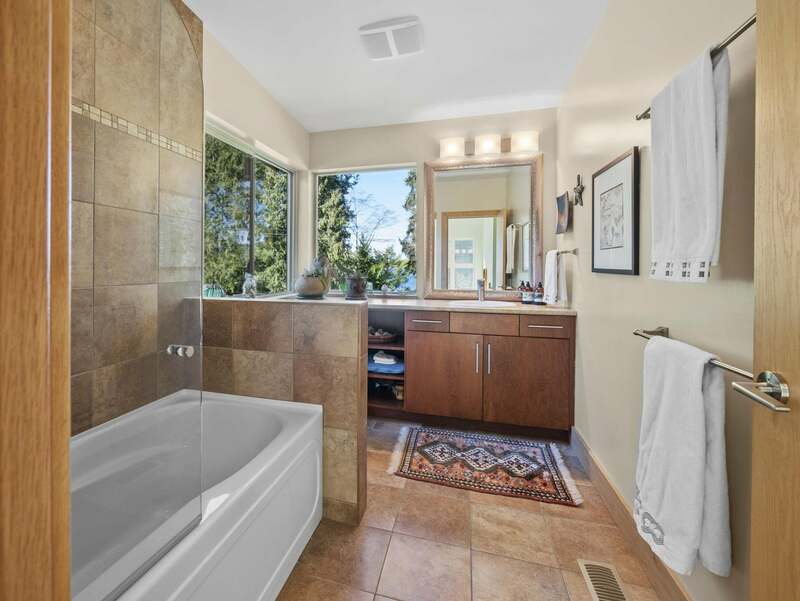 Custom designed and built, there’s a bath with a shower, a vanity, and corner windows for extra natural light. Across the hall is this home’s second bedroom. 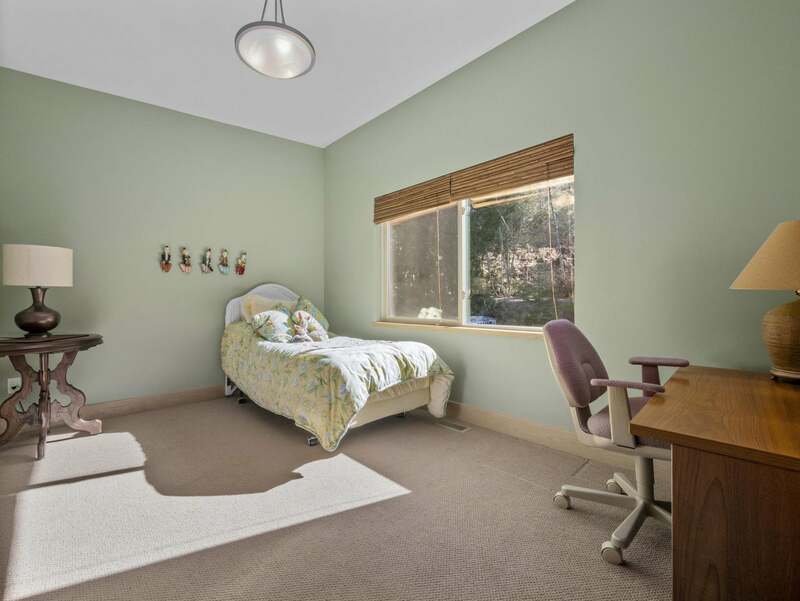 There are carpeted floors, a closet, and a window that overlooks the backyard. 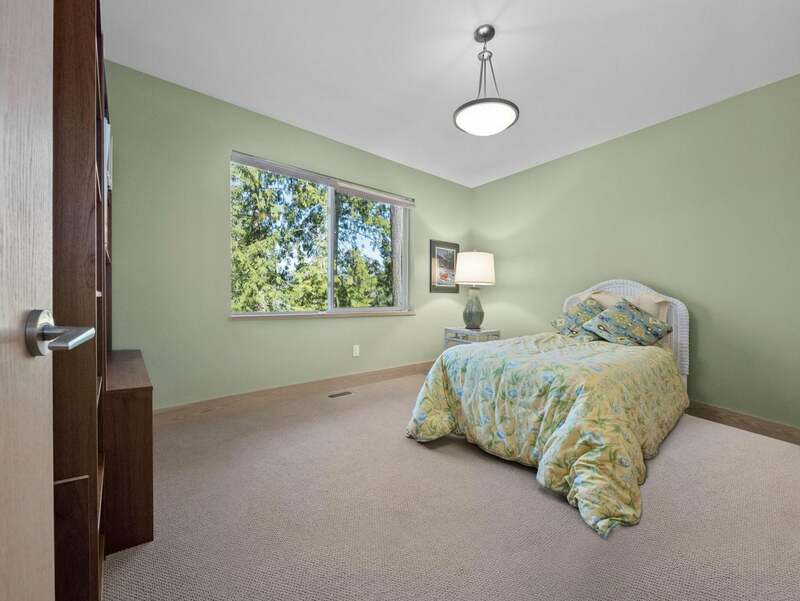 Next is the third bedroom. 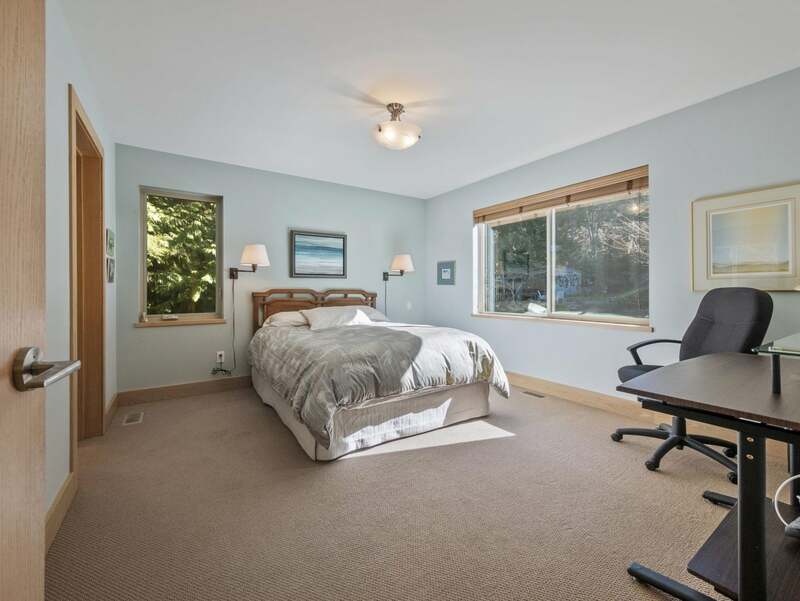 Like its neighbour, this room has carpeted floors, a large window, and its own closet. 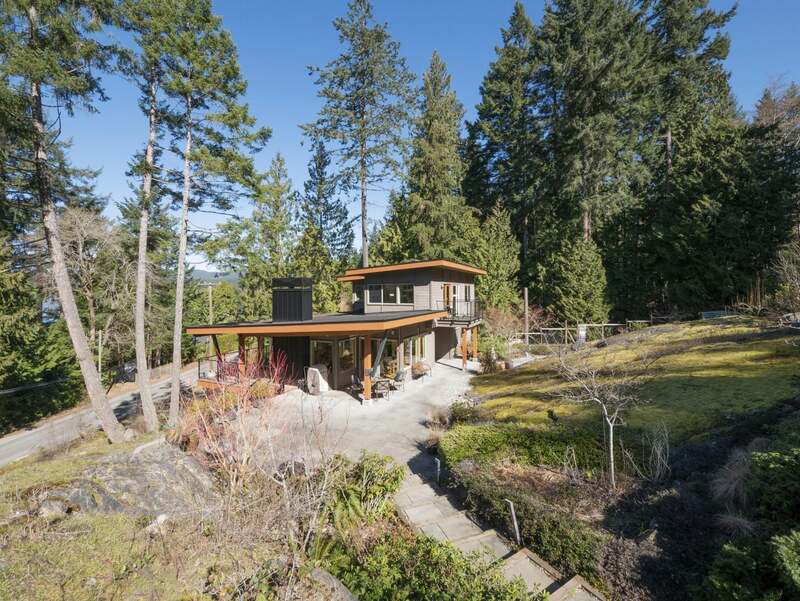 8688 Redrooffs Road is an amazing property. 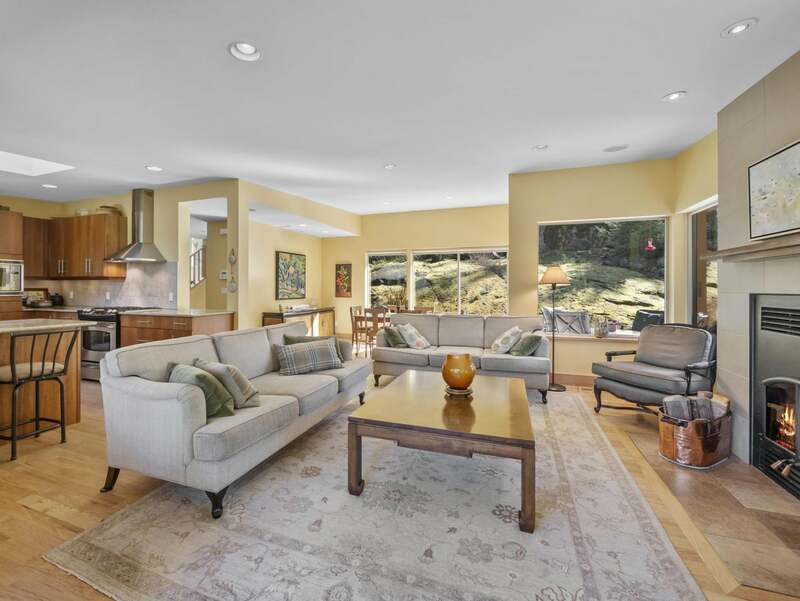 You can’t help but experience a sense of joy and calmness within this home. This feeling extends to the yard and whichever open space you choose to find yourself in. 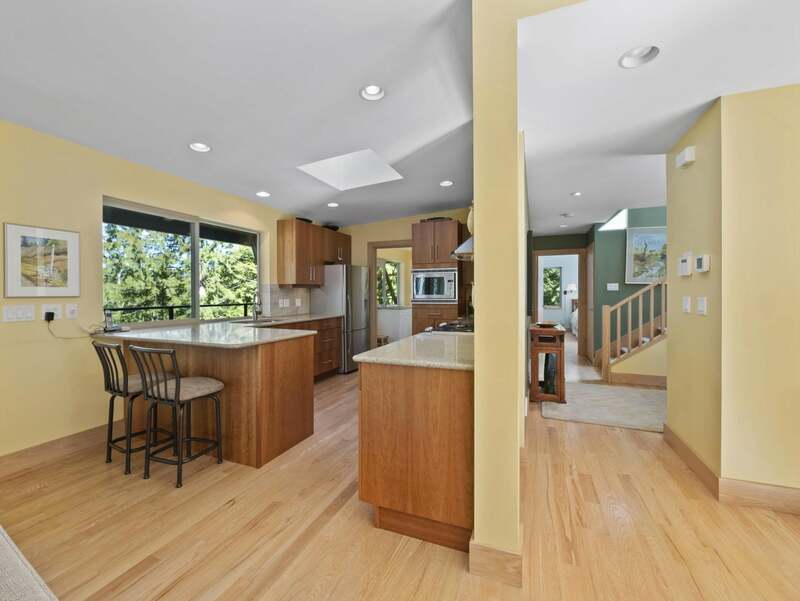 This home has been lovingly built and cared for. Thoughtful quality choices were made throughout. This is the home you've been waiting for. Contact your Realtor for an info pack today! 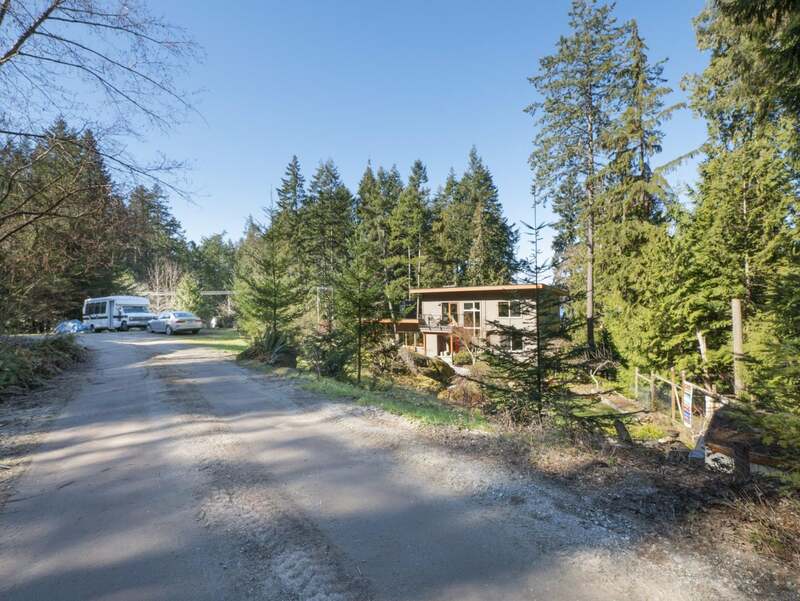 Please send me more information on 8688 Redrooffs Road, Sunshine Coast. Thank you.